The Florence Baptistery is part of the Duomo complex, which includes the Cathedral of Santa Maria del Fiore and the Campanile. Historians believe that construction of the Baptistery, also known as Battistero San Giovanni or Saint John's Baptistery, began in 1059, making it one of the oldest buildings in Florence. The octagon-shaped Baptistery is best known for its bronze doors, which feature exquisitely carved depictions of scenes from the Bible. Andrea Pisano designed the south doors, the first set of doors commissioned for the Baptistery. The south doors feature 28 bronze reliefs: the 20 upper reliefs show scenes from the life of St. John the Baptist and eight lower reliefs contain representations of virtues, such as Prudence and Fortitude. Pisano's doors were mounted on the south entrance of the Baptistery in 1336. Lorenzo Ghiberti is the artist most associated with the Baptistery doors because he and his workshop designed the building's north and east doors. In 1401, Ghiberti won a competition to design the north doors. The famous contest, held by Florence's Wool Merchants' Guild (Arte di Calimala), pitted Ghiberti against Filippo Brunelleschi, who would go on to become the architect of the Duomo. The north doors are similar to Pisano's south doors, in that they feature 28 panels. The top 20 panels show the life of Jesus, from the "Annunciation" to the "Miracle of Pentecost"; below these are eight panels depicting saints Matthew, Mark, Luke, John, Ambrose, Jerome, Gregory, and Augustine. Ghiberti began working on the north doors in 1403 and they were placed at the north entrance of the Baptistery in 1424. 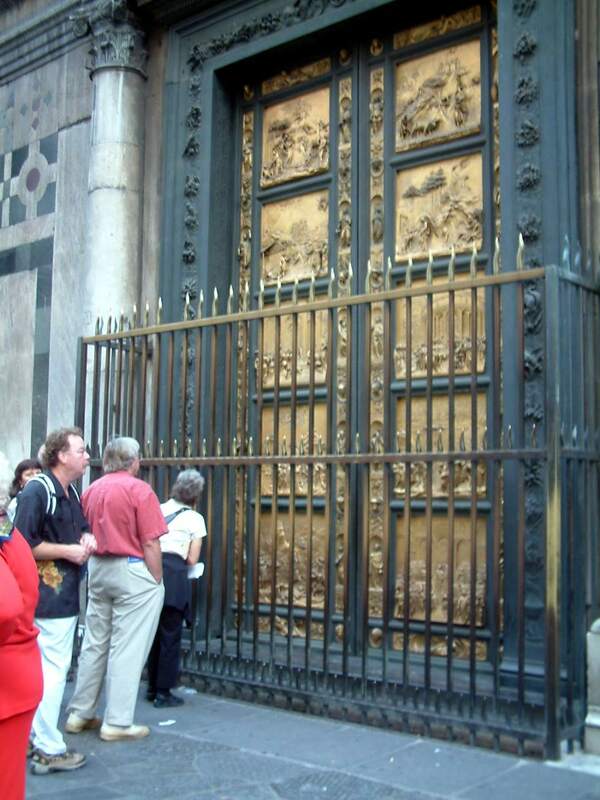 Because of Ghiberti's success in designing the Baptistery's north doors, the Calimala Guild commissioned him to design the east doors, which face the Duomo. These doors were cast in bronze, partially gilded, and took Ghiberti 27 years to complete. In fact, the east doors surpassed the beauty and artistry of his north doors – the perspective that Ghiberti was able to achieve on a low-relief surface still astounds art historians to this day. The east doors contain only 10 panels and show 10 very detailed biblical scenes and characters, including "Adam and Eve in Paradise," "Noah," "Moses," and "David." They were erected at the east entrance of the Baptistery in 1452. Some 100 years later, when Renaissance master Michelangelo saw the east doors, he dubbed them the "Gates of Paradise" – and the name has stuck ever since. To protect them from the elements, all of the reliefs currently visible on the doors of the Baptistery are copies. The originals, as well as the artists' sketchings and molds, are in the Museo dell'Opera del Duomo. While you can inspect the door reliefs without purchasing a ticket, you should pay admission to view the Baptistery's remarkably beautiful interior. It is decorated in polychrome marble and its cupola is adorned with golden mosaics. Arranged in eight concentric circles, the incredibly detailed mosaics show scenes from Genesis and the Last Judgment, as well as scenes from the lives of Jesus, Joseph, and Saint John the Baptist. The interior also contains the tomb of Antipope Baldassare Coscia, which was sculpted by the artists Donatello and Michelozzo. Of course, the Baptistery was built to be more than a showpiece. Many famous Florentines, including Dante and members of the Medici family, were baptized here. In fact, up until the 19th century, all Catholics in Florence were baptized in Battistero San Giovanni. Location: Piazza Duomo in the historic center of Florence. Hours: Sundays 8:15 am to 1:30 pm, Tuesday-Friday 8:15 to 10:15 am, 11:15 am to 7:30 pm, Saturdays 8:15 am to 7:30 pm. Admission: A cumulative ticket to the entire Duomo complex costs €18 and is valid for 72 hours after the first entry. Information: Visit the Baptistery website, or call +39 055 2302885.